Gives elasticity, density and firmness to the skin. 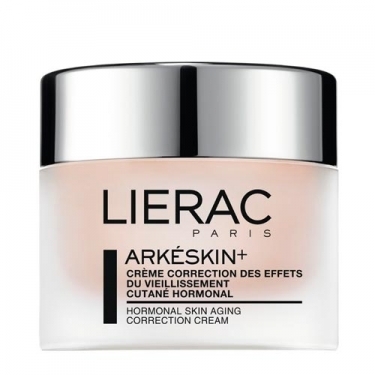 DESCRIPTION: Arkeskin+ Crème Riche from Lierac is a cream suitable for fighting the hormonal aging of the skin due to menopause or pregnancy. Indicated for normal to dry skin. It redensifies and reconstructs the cellular tissue weakened by the hormonal changes, without recourse to estrogens. The skin becomes smoother, more toned and spots become clear. Contains Nacre powder capable of stimulating cellular regeneration, Sesame extract to prevent dehydration, Chestnut extract to promote the synthesis of Ceramides, redensifying the skin, water picking agents for prolonged hydration. Apply in the morning and/or at night, throughout the clean face and neck, through a gentle massage.